The Kentlands development in Gaithersburg, Maryland, located north of Washington, DC, offers residents a high density of services, restaurants, and entertainment. Inspired by the New Urbanism design movement of the 1980s, the Kentlands aims to promote environmentally friendly habits. It is a walkable, mixed-use community that combines pedestrian-friendly streets and live-work buildings. From a residential perspective, the Kentlands (also referred to simply as Kentlands) has been a success, with more than 8,000 inhabitants living in the development and its sister community, Lakelands. But the town has had challenges on the retail side, including assembling an ideal group of businesses that will have long-term success. In line with the initiative to energize Kentlands’ retail businesses and boost economic development, SymGEO—a Maryland-based company that specializes in geospatial data analytics—developed Downtown: Energize! Kentlands. 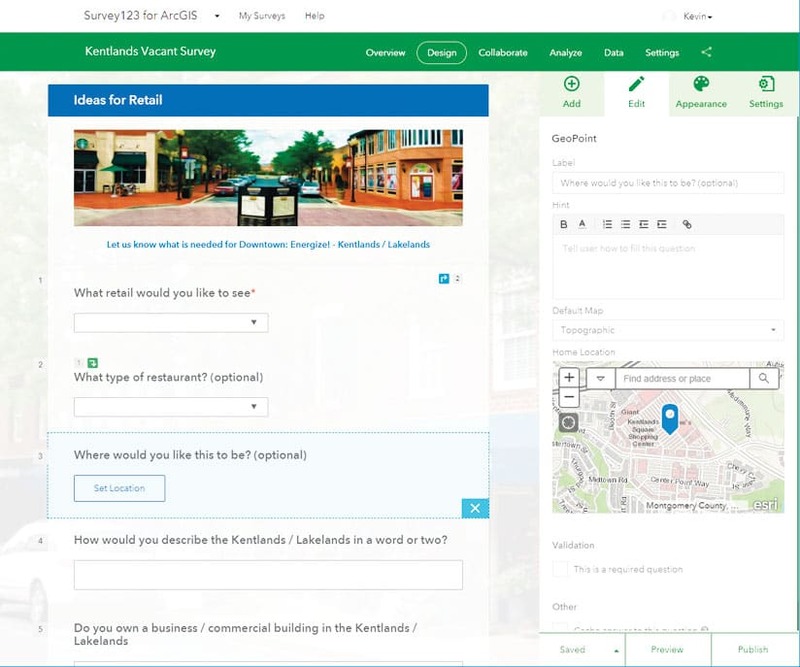 The web-based community engagement platform, built on ArcGIS Hub, is designed to inform the public about future plans for Kentlands and provide a feedback mechanism for residents to express what kinds of retail offerings they would like to see. The surveys on the site, which SymGEO created using Survey123 for ArcGIS, are providing residents with the voice they feel they have been missing and are helping to relieve considerable frustration. The site combines a number of components of the ArcGIS technology suite, including Survey123 for ArcGIS, GeoForm template, Collector for ArcGIS, Operations Dashboard for ArcGIS, and Web AppBuilder for ArcGIS for the retail locator. It also features a fun and visually stunning “Can you picture your business here?” 3D web scene that uses Esri CityEngine textured models derived from building footprints and lidar information processed in ArcGIS Pro. The web scene allows site visitors to virtually fly through the neighborhood. The surveys on the site, which were created using the form-based questions in Survey123, have garnered the most excitement from the public, according to McMaster. Employing ArcGIS Hub was a substantial improvement over the town’s older methods of gathering public opinion, McMaster said. Previous solutions involved a series of Facebook pages, disconnected websites, and social media posts, which made it difficult to track progress and find information. Additionally, social media comments were quickly lost, and there was no permanent record of posts and comments. By implementing ArcGIS Hub, McMaster can now track evolving word clouds, with keywords pulled from the filled-out Survey123 forms, to understand residents’ opinions and impressions about the neighborhood. “The summary word cloud is an excellent snapshot of the residents’ ideas on what retail is needed, as well as the general feeling about Kentlands,” he said. 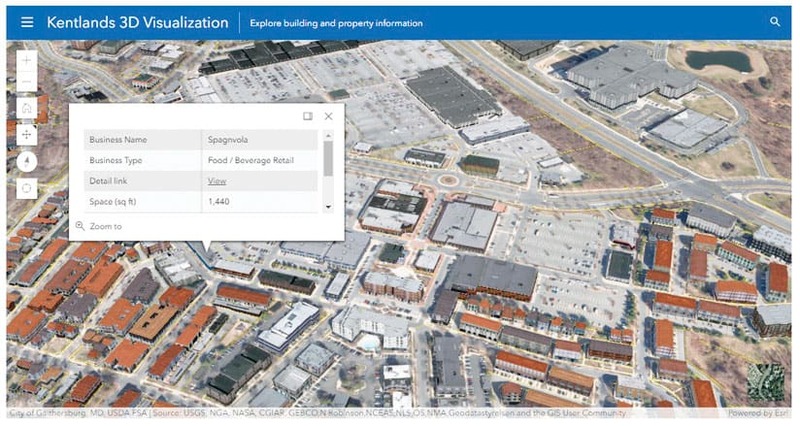 A database of commercial properties, hosted in ArcGIS Online as a feature service, fuels an Explore Existing Retail app on the hub site as well. The database includes each business’s name, its square footage, the business type, its web URL (if available), and whether or not the property is occupied. McMaster got much of this information from parcel data, the three large commercial property owners in the area, and assessor data from the City of Gaithersburg. He then filled in the blanks by gathering additional data in the field using Collector and GeoForm template. The hub app is dynamic and connected directly to these data sources, so site visitors will always find the latest information. Downtown: Energize! Kentlands features a 3D web scene that lets site visitors virtually fly through the neighborhood to get a better idea of whether their businesses will fit in with the mixed-use community. Moreover, the flexibility of ArcGIS Hub allows McMaster to continually add new features to the site and improve its capabilities. For example, he recently populated the commercial database with local business data and expanded it to include all sections of the neighborhood. McMaster also incorporated a community calendar that shows all the local happenings. Residents can search the Downtown: Energize! Kentlands site for all retail offerings in Kentlands, and planners can see immediately calculable summary statistics—such as the number of businesses per business category and/or locale—to aid in doing gap analyses for future retail offerings. “The goal of informing the public has been easily accomplished by keeping the spatial data up-to-date as new retail is announced or observed,” McMaster said. Use of ArcGIS Hub for Downtown: Energize! Kentlands has also made it quicker and easier to gather community feedback. Residents’ support for this new community engagement platform has been strong and generally positive. McMaster said that Downtown: Energize! Kentlands was recently mentioned at a public meeting as an example of how people can voice their opinions and have the results aggregated and given to key retail decision-makers. Local businesses have been supportive of the platform as well because the site enables users to search a list of existing businesses. “There is no other site that offers the comprehensive, updated list of all retail establishments, so it is great for people wanting to get a feel for what is available,” said McMaster. Two local development boards, the Kentlands Downtown Working Group and the One Main Street Initiative, have taken an interest in Downtown: Energize! Kentlands. 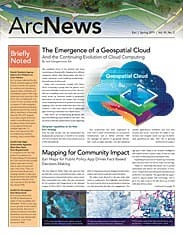 The groups are so enthusiastic about the platform that they are now exploring options to have complementary sites built using ArcGIS Hub technology. The site has provided the voice that people have been missing. It has helped relieve considerable frustration. The use of open data in an area like Kentlands means members of the public can stay informed, connected, and up-to-date with what is happening in their community. McMaster encourages this trend toward open data. McMaster, who developed the site pro bono, said he’s at the stage where residents and local officials are just becoming familiar with GIS technology and its possibilities. They are seeing firsthand how GIS, together with open data, can help transform a community. He hopes other cities will adopt the platform as well. Whether taking on an issue that’s similar to retail development or addressing something else that residents want to see improved, McMaster believes it is very rewarding to get a community’s residents engaged, excited, and energized about an idea and then facilitate action using this platform. For more information on Downtown: Energize! Kentlands, contact McMaster at kevin.mcmaster@symgeo.com.